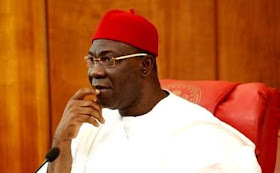 Uche Anichukwu, media aide to deputy senate president Ike Ekweremadu, said his principal did not take ill because of the Economic and Financial Crimes Commission (EFCC) interrogation. The lawmaker reported to the office of the anti-graft agency on Tuesday and Wednesday. He is under probe for allegedly owning undeclared assets. Ekweremadu was said to have complained of discomfort when he was being interrogated on Wednesday. But in a statement on Friday, Anichukwu explained that when his principal reported at the EFCC office, there was no interrogation because he informed them that he was ill and he was allowed to go for treatment. “Since the siege would not allow him to honour the belated ‘invitation’ the same day, he, as a law-abiding citizen, wrote to the EFCC to request for another date, hence the rescheduled appointment of Tuesday, July 31, 2018,” the statement read.